Lower level of football knowledge is excusable(because she acknowledges she didn’t watch football before this job), but being obnoxious is not. Such a shame because Nick and Derek are exceptional. From Washington State & this is the best podcast of the 3! More Helman & who do we have to pay to get more Ambar Garcia? If you must have a female on this podcast, please get someone who can speak good intelligible English. It hurts me to listen to her. I have to fast forward whenever she starts talking. I hate to be mean like this but she is not a professional. There has to be a better female speakers. Half the time she can’t think of a word or she mispronounces common English phrases and names of the players. The rest of the guys are great and provide good insights to the team. I appreciate this show... huge fan of Nick Eatman. Out of the three podcast groups this is my favorite. Very insightful and entertaining. These guys and gal really know Dallas Cowboy football and hit every point. Definitely recommend! Love the podcast, I download and listen everyday while I’m at work. Love Eastman’s wit and knowledge on the team while I also like the way Helman keeps it 100 with his views. Credit to Derek for his insight and continued effort to gives us fans cutting edge technology. Been listening for about 3 years now. Like everyone on the show but Nick really brings something you can’t get anywhere else, which I didn’t notice until Bryan was moved. Agree with previous reviews about Ambar; football analysis isn’t in her wheelhouse and seems like she’s reaching for opinions and controversy. She is good at giving insights from discussions with players and coaches so I think there’s a role somewhere she is just miscast right now. My favorite parts of the show are when Nick and Dave go back and forth with Derek moderating. Just don’t feel like there is room for a 4th personality. The regulars of this show have been Derek Eagleton and Nick Eatman. They provide a constant quality of cowboys analysis, questioning, and conversation. However, the other cast members have rotated through the years. This year happens to be the year of Amber and David, and the show still remains the best cowboys podcast on the air. I thought it couldn’t get better than Nick, Derek, Taylor, and Bryan, but this show just delivers. I’ve tried to power through Ambar, but it’s not possible. Her thoughts and opinions seem so elementary compared to the others. She has no supporting data when she starts talking. Sorry, not a good choice. I guess it's the cowboys political hour now. Stay out of politics you morons. Don't act like everything was great before politics got involved. Our feelings as fans have just been expressed. Sitting for the anthem is divisive and was meant to be divisive. Stop blaming outsiders. The show changes its cast of characters season to season, but it will continue to be the best Cowboys podcasts out there as long as Nick Eatman and Derek Eagleton remain at the helm. Derek is a great host, and Nick is a Cowboys encyclopedia that also gives some of most thoughtful commentary in sports. Add in that these guys work in the same facility as the team, and get actual scoops without lowering themselves to the level of today's media, and you've got yourself a gem. Keep up the good work, guys (and gals)! Wow, I just listened to a 20 minute debate on whether Dak is more accurate in the first half or second half. The argument was based on a 66% completion rate versus a 67% rate. This is a meaningless discussion to have in June or July to kill some time, not after week one. There are a hundred things to talk about headed to Denver. Get real guys! Ambar Garcia is hard to listen to. She has no experience watching football before like 2014. She barely knows the game, and what she does know carries a very short-term bias. I think her hiring reflects poorly on the creative decisions made by the production of the show. Good info for a Cowboys fan, but I feel dumber after hearing these guys speak. "Presunably" is not a word fellas. Broaddus knows his stuff and isn't afraid to say it. Much better all around than the bickering and homerism on talkin cowboys. Tay asked a hard question about visiting the White House earlier, really loved the professional responses. Especially BB. 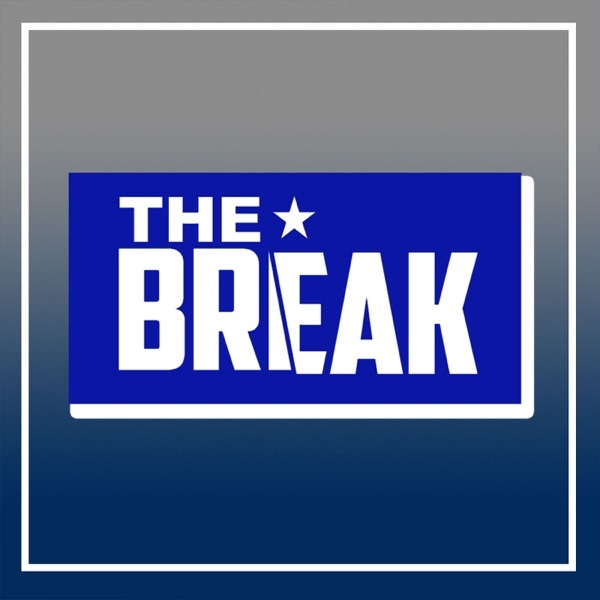 Cowboys Break is the first and so far only football podcast I listen to. The best Cowboys podcast around. Not homers. I wish this podcast was even longer. The whole staff is fair with their opinions and give real insight. Taylor I feel ask good questions keeps the rest of the group talking and it makes it feel like time flys by. I have learned A LOT from Bryan who is a former scout and is the best come draft time! When they start talking about the draft during the offseason. Listening to Bryan, I almost feel like he is a professor educating me on how the draft works and I learn so much. If you want a insightful and intelligent show that flys right by this is the one for you! As a die hard cowboys fan I just can't get enough of Dallas Cowboys news. This podcast is funny and informative. The best Cowboys podcast period. Brian Broaddus is this podcast. Without him I wouldn't even listen to a Cowboys podcast. He tells it like it is and doesn't sugarcoat it, unlike the rest of the cast and that horrible "Talkin' Cowboys" podcast. Here's hoping that they can keep Brian on the show for years to come. I'm a Cowboys fan til death, but I refuse to listen to opinions that are filtered through Cowboys ownership by a team-owned broadcast. The Break is a great way for mwe to keep up with Cowboys news. They have plenty of solid information, actively root for and support the team, but call it like they see it as well. Love this podcast. All members of the show contribute tremendously. Great insight for the everyday happenings at Valley Ranch. Keep up the good work. And Ed Cahill Best podcast ever. I love the podcast I am a big Cowboys fan in Wisconsin so you can imagine how much I love Cowboys content and these guys are all great and very funny. Great show!! I listen all season, every season. Keep up the great work guys!! Been listening forever. Always a great show. A good mix of humor and facts hopes the great flow of the show continues. I've been a Dallas Cowboys fan since age six and I've just started recently listening to this podcast. Love it. 5 stars all the way. Love listening to these guys, nothing makes a road trip more enjoyable for me than listening to Eagleton, Eatman, Dia, and Ellis...except for the horrendous AT&T commercials. I listen to TLB and Talkin Cowboys daily and I enjoy them both in their own way. Very up-to-date on what's going on in Valley Ranch. Each has it's on characters which makes it fun too. I listen to both podcast coming out of Valley Ranch. They have access to the team as i am pretty sure their paychecks come from Jerry Jones. But they are paid to be objective and you will rarely hear them claiming the Cowboys are good. They are journalist who spend their work days at the Cowboys practice facility, thus the inside information & fortunately not sensationalist BS that you get from National media. 1st & foremost, this is a great/entertaining/informative show. I appreciate the perspective of everyone on the show. You may not agree with everything said on the show but hey it makes for a great show. Nick's the comedian of the bunch but they all add a lil something to make the show a blast.